So I bought some new saddlebags, or rather old saddlebags, that were originally accessories for the Royal Star Tour Classic (see pictures below). I have seen some of these on Road Stars, but now that I have these new old saddlebags sitting in a box in my garage, I think it might be a good idea to actually, you know, attach them to the Road Star in some way, shape or form. So, for you guys that have put these on your Road Star... how did you go about it? Did you need to fabricate some new saddlebag frames? Did you modify the current frame on the Road Star, or the Royal Star saddlebags somehow? Pick up some old Royal Star frames and modify them to fit the Road Star? Enquiring minds want to know. The Road Star in question, by the way, is a 2001 Silverado. The bike in the picture is my former Royal, or as I called it, "The Jalopy." The Royal star tour deluxe bracket # str-4NL73-40-00 will not mount to a Roadstar without lots of fab work. I found this out the hard way and have a brand new set of the Royal star brackets hanging on the wall now to remind me to do more research more before i buy!! Thanks for the quick reply. So, $309 Euro or, by my conversion $358 plus shipping from Europe... ouch. Looks like they took a Royal Star frame and welded on the front bits from a Road Star frame. They do come up on Ebay, Check on the Facebook Road Star clinic, some sellers on there. 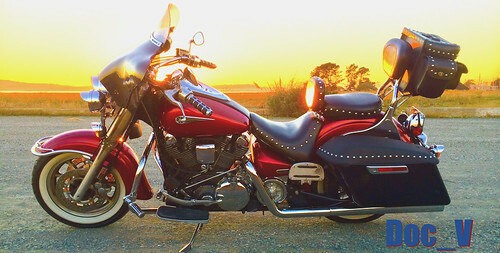 Yamaha has saddle bag brackets for those bags to mount on to the Road Star. I have them on my bike. I see in Mort's picture, a part number STR4WM73. The pictured brackets are the ones. Awesome, thanks! I put a watch on those! Will those mount up to Dchoppers brackets ? Your talking about the bags? Yes, just wondering if the OP could buy a set of those for his bags to mount to. They would need to be modified as the have a pipe going across the bottom that sits in the HD bag channel under the Harley bags. Thanks for the suggestions and the links to the bits and pieces on eBay. I am taking a look at those. You folks are, as always, awesome with your help. Haven't gotten back to post in a few days since I have been swamped with work. I started a consulting biz at the beginning of the year, it's one of those things that seems to swallow all your time even when not getting paid, so counting every penny right now. Shouldn't have bought the saddlebags, but you know, it is for the motorcycle after all, and now in for a dime, in for a dollar. So I will probably have to pick up the frames on eBay now. I have a set of those bags and brackets that I removed from my roadstar. Would sell brackets or bags and brackets if interested. I like it! Looks good on that bike with the seat and fender bib. Looks like a fun ride. I wouldn't mind having one as a second bike.